If you want to get the most performance possible out of your Cummins 4BT engine, you need to have quality parts in it. We stock premium Cummins 4BT engine parts that are built by the top brands in the industry to make your engine run great. We're passionate about modifying diesel trucks so they run their best, and we are just as passionate about our customers doing the same. That's also why we match all of our competitors prices: so you can get a great deal. We've got it all: bearings, roller rocker assemblies, cam bushings, gasket sets, valvesprings, headstuds, main studs, rod bolts, roller rockers, and much more. We also want to make sure you get your parts delivered fast, so you can get started on your truck. We work hard to ship out our orders as soon as we receive them. CPP Diesel strives to deliver the best possible customer service to our customers. 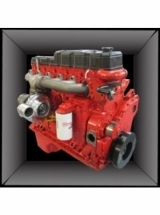 Feel free to explore our selection of quality Cummins 4BT engine parts. If you have any questions about our selection, or you are having trouble finding the part you are looking for, give us a call at 724-785-4022, or send us a message on our chat system, and we'll get back to you as soon as possible. Browse our store and order your parts today.